Investing in treatment for social anxiety and related problems is a huge topic that has a ton of angles. While social anxiety is a major mental health challenge impacting millions, the disorder has proven to be a major challenge for the mental health community. The primary reason is that social anxiety is driven by the underlying emotions of shame, embarrassment, and humiliation. Most sufferers do not seek help, making it the quintessential “disease of resistance.” The information on www.socialanxiety.com is the result of psychotherapist Jonathan Berent’s clinical experience since 1978, which includes the treatment of literally thousands of patients of all ages. While there are numerous manifestations of social anxiety, including performance anxiety, fear of public speaking, selective mutism, erythrophobia (fear of blushing), hyperhidrosis, fear of being noticeably nervous, school phobia, dependent personality, and pervasive social avoidance, there are two basic types of individuals who have the problem: These are people with “initiative” and those without “initiative”. Initiative does not mean ability. It means the motivation to start up or motivation to get help. When an individual of any age does not have initiative, treatment begins with parents, given the avoidance-dependence dynamic. The dynamic that distinguishes social anxiety from other anxiety disorders is the element of performance. That said, social anxiety is commonly co-morbid with other anxiety symptomatology; especially Obsessive-Compulsive Personality Disorder, which includes perfectionism and Obsessive-Compulsive Disorder. 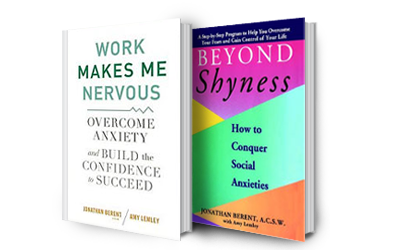 Jonathan’s book Beyond Shyness: How to Conquer Social Anxieties (Simon & Schuster) was so named because “shyness” is too abstract and nonfunctional a term. The reality is that shyness is social anxiety. The question is, to what degree is it present? 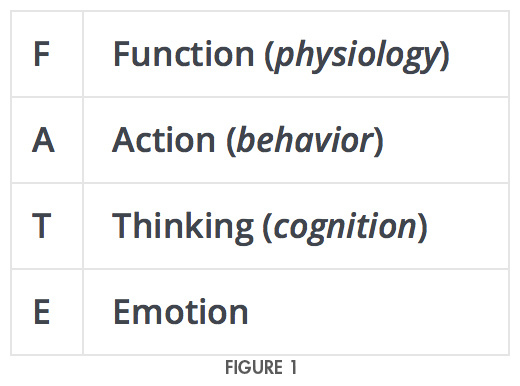 To really understand the phenomenon, it is important to understand its components. Think of F.A.T.E. (See Figure 1). Any treatment modality that does not integrate this architecture is, in essence, trivializing the problem. The biggest confusion that people experience when starting treatment is understanding how ingrained the problem can become. That’s the reason intervention as early as possible will facilitate high performance treatment. Each individual has their own learning curve. The primary variables for this include length of the problem, severity of the problem, motivation, expressive ability, ability to integrate new concepts, readiness to face fear, and degree of obsessive worry and panic. Think you may have social anxiety? We all need moments of solitude, but people are primarily social creatures. Connecting with others gives us a sense of meaning and purpose, and helps us make our way in the world. The most evidence based clinical success for social anxiety since 1978. Jonathan Berent, L.C.S.W., A.C.S.W., is a psychotherapist who has been practicing since 1978. 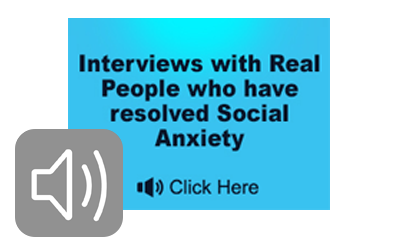 He has created the Berent Treatment Method for Social Anxiety, which is the result of his clinical work with thousands of individuals of all ages with social anxiety since 1978. He is the author of Work Makes Me Nervous: Overcome Anxiety and Build the Confidence to Succeed (Wiley, 2010), Beyond Shyness: How to Conquer Social Anxieties (Simon & Schuster, 1992), and Social Anxiety: The Untold Story, which is an accredited course for mental health professionals in using the Berent Method to treat social anxiety. (Andrew Kukes Foundation, 2011). Socialanxiety.com, has served millions of unique visitors as a multimedia clearinghouse for patients, parents, and fellow mental health professionals in search of articles, educational materials, and books on social anxiety and related subjects. 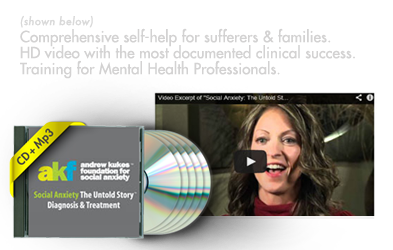 His library of clinical interviews appears to be the most documented clinical success with social anxiety.